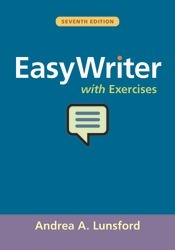 When your students need reliable, easy-to-find writing advice for college and beyond, EasyWriter with Exercises gives them what they need in a format that’s easy to afford. Andrea Lunsford meets students where there are with friendly advice, research-based tips for solving the Top Twenty writing problems, and an emphasis on making effective rhetorical choices. The seventh edition puts even more emphasis on empowering students to become critical thinkers and ethical communicators with new advice about fact checking and evaluating sources and more advice about choosing language that builds common ground. In addition, the seventh edition offers more support for writing in a variety of disciplines and genres and more models of student writing to help students make effective choices in any context. EasyWriter with Exercises can be packaged at a significant discount with LaunchPad Solo for Lunsford Handbooks, which includes dozens of additional writing models as well as exercises, LearningCurve adaptive quizzing, videos, and podcasts.